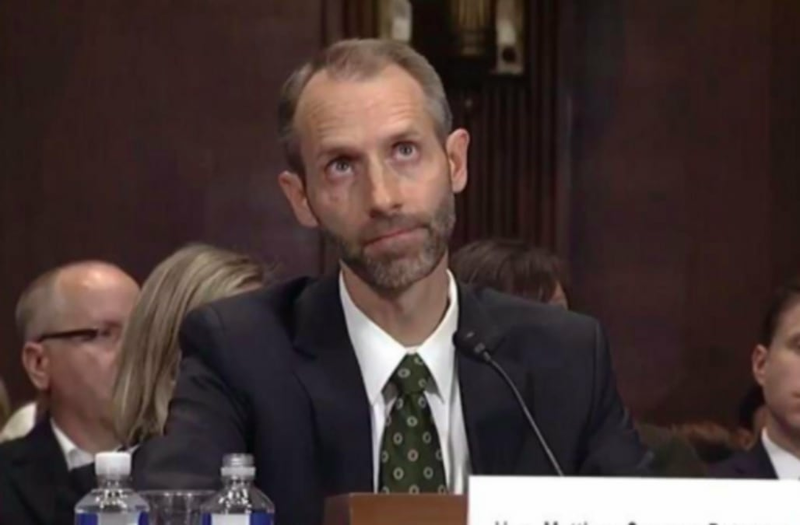 WASHINGTON ― President Donald Trump’s judicial nominee Matthew Petersen has withdrawn his name from consideration after a video went viral of him failing to answer basic questions about law in his confirmation hearing, according to an aide to a senior member of the Senate Judiciary Committee. "It happened," the aide told HuffPost on Monday. Multiple requests for comment from the White House were not returned. Requests for comment from Sen. Chuck Grassley (R-Iowa), chairman of the Judiciary Committee, also were not returned. A request for comment from Petersen was not immediately returned. Trump nominated Petersen, who is currently a member of the Federal Election Commission, to be a lifetime judge on the U.S. District Court for the District of Columbia. But Petersen’s lack of qualifications were painfully on display last week as Sen. John Kennedy (R-La.) asked him about his courtroom experience. Peterson also could not explain basic legal terms, when pressed by Kennedy. PETERSEN: Yes... I haven’t, I’m, again, my background is not in litigation as when I was replying to Chairman (Chuck) Grassley (R-Iowa), I haven’t had to um, again, do a deep dive. Petersen is Trump’s third district court nominee to get derailed over a lack of qualifications. Brett Talley, a 36-year-old lawyer who had never tried a case and earned a rare and unanimous “not qualified” rating by the American Bar Association, withdrew his nomination last week. Jeff Mateer, who had described transgender children as evidence of “Satan’s plan,” is not moving either. These are embarrassing setbacks to Trump’s otherwise successful push to fill up federal courts with his lifetime judges. The Senate confirmed 12 of his circuit court judges this year, more than any president has gotten in their first year since the courts were created in 1891. That’s in addition to putting Neil Gorsuch on the Supreme Court and getting six district court nominees confirmed. It doesn’t sound like the president cares if a few of his nominees go down. Kennedy told local news affiliate WWL-TV on Monday that Trump called him Saturday to talk about Petersen and said he agreed with Kennedy’s criticisms that his nominee wasn’t qualified. Kennedy said Trump has also told him that he’s counting on senators to reject his bad judicial picks. “He has told me, ‘Kennedy, when some of my guys send someone who is not qualified, you do your job,’” the GOP senator said.